Square Strike Wedge: Have You Tried It? What is the Square Strike Wedge? A lot of golfers dread those greenside shots. They see improvement in their putting. They may be driving the ball better all the time. But when it comes to chipping, many golfers just don’t know if they can trust their own swing. If this describes you, you may have already heard of the Square Strike Wedge. This wedge is designed to help golfers chip better and with greater consistency. The club has been modeled more closely to the design of a putter, rather than a wedge. This approach is intended to result in a tighter shot pattern and better shots. In fact, Square Strike Wedge spokesman (and two-time U.S. Open Champion) Andy North says golfers who use the Square Strike Wedge start trying to hole chip shots soon after they first pick up the club. This is an appealing thought for golfers who are just praying they don’t chunk the ball again. The question, of course, is why would a more putter-like design improve your chipping? Let’s take a look at exactly what the Square Strike Wedge is and how it’s designed so you can consider whether it might be worth a try. Putting is about using larger muscles that are easier to control. If you’ve been trying to improve your chip shots, you’ve probably collected a lot of advice, like “hinge and hold.” The form for chipping often requires exact motions and perfect timing in small muscles like the wrists. Those muscles are more difficult to control with precision. They can be twitchy, and the smallest false move can throw off the whole swing. In an effort to combine the best of both a putter and a wedge, the designers engineered a wedge that is meant to be used with a putting motion. Using this club, you swing with a “straight back and through” pendulum motion. There is no wrist hinging and significantly less risk of accidentally rotating the clubface. This is what makes it easier to chip consistently and approach those greenside shots with confidence. But how does a club that swings like a putter still get the up-and-down ball flight you need for a chip shot? The Square Strike Wedge has a 45-degree loft, similar to a pitching wedge. So, despite its putter-like attributes, this club is still definitely a wedge. The club is engineered with chipping in mind, but the design team also wanted to make it as versatile as possible. It can be used for pitching and is even made to move cleanly through the sand for bunker shots. This versatility was what designers had in mind when choosing the 45-degree loft. This should be enough to help you navigate a variety of lies. The putter aspect of the Square Strike Wedge shows up in the length, lie angle, and head weight. The club is 35.5 inches long – that’s somewhere between a standard men’s putter and a pitching wedge. The goal of this shorter length is to position you over the ball (like a putt) and give you more control over your swing. The lie angle is 68 degrees, which is what you get in a standard putter. This lie angle is four degrees more upright than a wedge. Once again, the idea is to get you closer to the ball for better control. Finally, the head weight is 330 grams, identical to that of a putter. The extra weight discourages wrist action and facilitates that pendulum putting motion intended for use with this club. The club designers also use weight distribution to help you control the clubface. The Square Strike Wedge features Anti-Rotational Weighting. This means weight has been shifted from the heel of the club closer to the toe, discouraging accidental face rotation. Between the weight distribution and the precisely squared center of gravity, the designers have engineered a forgiving club. These elements make it easier to stay square to the target and hit the ball in the center of the clubface. The Square Strike Wedge has what they call an “Anti-Chunk Sole.” The sole of the club is extra-wide and gently curved with shallow grooves designed to help the clubhead move smoothly through matted grass. There is also a No-Dig Leading Edge. This refers to the angled design of the leading edge to help prevent digging. Overall, this club is intended to help you have more fun making those greenside shots and navigate the course with confidence. But now that you understand the design, let’s talk business. What is the investment here? And is it worth it? One of the first things anyone wants to know from a product that promises to improve your game is: Why should I trust the designer? Anyone can claim to have the solution. It’s important to know who engineered this supposedly game-changing club. In this case, the design team is headed by Josh Boggs, a Golf Digest “Hot List” medal winner. It is probably also important to you to know exactly how often and in what circumstances you could use a Square Strike Wedge. As previously mentioned, the club is designed for chipping, but can also be used for pitching and bunker shots. It conforms to USGA and R&A rules, and the recommended use is any shot within 40 yards of the hole. The designers promise the club will help you chip more consistently. In fact, they suggest that you will discover so much improvement with the Square Strike Wedge that you will start trying to hole your chip shots, rather than just get it close. As for your own investment, the Square Strike Wedge is priced at $129, but is currently reduced to $99. The club comes with a 60-day money back guarantee. This club is a wedge engineered like a putter to help you stop chunking the ball and make better, more consistent chip shots. It is also designed to be swung like a putter, with a “straight back and through” pendulum motion. This helps you rely on those larger arm and shoulder muscles, rather than the smaller, less predictable muscles in your wrist. The Square Strike Wedge can be used for chipping, pitching, and bunker shots. The ideal distance for this club is any shot forty yards and in. The Square Strike Wedge conforms to USGA and R&A rules. The club costs $99-$129 and comes with a 60-day money back guarantee. Do you have any experience with the Square Strike Wedge? Let us know in the comments! We’re curious to know how it worked for you. Do you have any questions about this or any other buzzed-about product? Ask us! 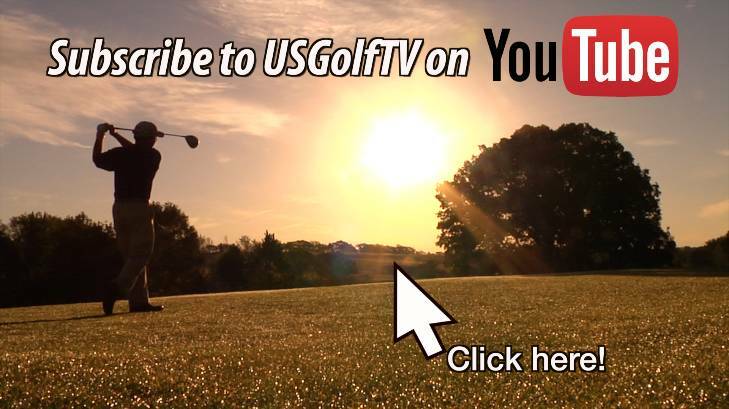 It’s our job here at USGolfTV to make sure you have the most up-to-date information on the latest innovations in golf. We also want to make sure we’re getting you the information you need on the topics you care about. You can read more about the Square Strike Wedge from our friends at Golfers Authority. Jump into the conversations, ask questions, and let us help you play better golf. Next post: What is Rotary Swing? Knowing I’m not going to hit it fat, even on razor thin lies gives you an amazing boost in confidence. Something good about not halving to chip with fear of failure. I’ve gone from a pretty good chipper to way above average. An added bonus I had not considered was the weight of the club is a tremendous tempo trainer on full shots. I can hit this club 115 yards extremely high with little effort. This club has helped make me a better ball striker with all my irons. Does this club provide any way to incorporate backspin and thereby assist in controlling roll distance? I’ve tried several chippers in the past and while they are certainly easier to get airborne and fly straight, the distance of the roll is very hard to control. Does setting the ball back in the stance help? I understand there may be a higher lofted wedge coming out. Should I wait on that one? Really like to see you guys test this one. There are a number of chippers out there and have been for years. I used to own one. They just didn’t measure up. It would be great to see you put this one through the paces in one of your tests. If you do here are the questions that I would have. How does the club perform in tight lie hard pan situations? The rails seem like they might be problematic in those situations. I know they promote this club for 40 yards and in. Just wonder what they do from over 40 yards? Finally, how do they perform in a short sided situation with not a lot of green to work with? Particularly from a little further off the green. Is this club USGA approved? Assume it is. Thinking about one for young grandson. I LOVE the club been hitting in monitors/ simulators have shorter swings dialed in from 105 yards and in. High spin and launch angle on fuller shots. Pick a distance can dial it in and accurately. Can’t wait for Mn winter to end to get outside. 31 degree launch 9000+ spin on full shots, pretty good. 40,50,60,70,yd pitches hardly more than a 1/3 to1/2 swing. 110 yards & in let’s play. I have no idea if I just purchased the club or not because the site kept me there so long that it timed out and closed IE. Regarding the club, this club, or one similar, was designed by Dr. Gordon Banerian in the late 90’s. He tried to sell it to Cougar and Callaway but they weren’t interested and he couldn’t afford to manufacture and market by himself. Somehow it has morphed into square strike. I know, from using the “Gordo” that it is very accurate and easy to hit, hopefully this club is the same. If my order went through I guess I’ll find out. Jon, thanks for the comment. We will keep these in mind if we do a club review video in the future! Tom, we do not sell the club nor are we affiliated with the manufacturers. You will want to contact them directly to verify purchase. Thanks for reading! I like this club. I think the trick to hitting it is to bring it back with the shoulders and not the arms. I just let it fall and the weight of the club pops it up. I just try to let the pendulum swing about an inch before the ball. – Someone asked saying they wish there was a 54 degree and I thought there was. I’m trying to find that out. It would be interesting to see how that club would work. I purchased this club a month ago and have hit over 100 balls in my yard, I must say it lives up to it’s billing! Out of 100 balls I only chunked one, because I hit 3″ behind the ball, not the clubs fault. I will say I hit the ball straight better than I have with a wedge and never worried about opening club face and hitting my garage. Upon trying this club I went back on line and ordered the 55 degree club, I have not receive it yet. Definitely a game changer. I have been using a chipper for ten years and this blows it away. Can’t wait to try this on the golf course. I’m a 5′ 6″ female, so are all the square strike wedges the same length and weight for everyone? I had an old club that was labeled a 10 iron that I lost. I holed several chips with it–looked flat like a 3 iron but somehow had loft. Since I lost it my chipping has never been the same. I wonder if this club would be like that one? I am a 5’2″ tall woman. Is this club workable for me? The club largely performs as advertised. However, I think the manufacture missed the mark in a couple of areas. First, the club comes with a cheap, thin rubber grip. Based on the intended swing style the club is to be used with (an extended putter stroke), it should be equipped with (at least) an oversized grip more closely resembling the current size and style of current putter grips. Second, there is no head cover included! The company’s excuse is that this is a ‘wedge’, and “nobody out there provides a head cover with their wedge.” Although technically a wedge, the head clearly resembles a rear-shafted putter, and it would have been very easy and appropriate to provide a putter-style head cover. One final note on design; maybe I’m just one of many who prefer a center-shafted putter, but I think moving the shaft forward to position it in the rear 1/3 of the head would put the shaft in a ‘best of both worlds’ location and help putters use, as promoted, a putting stroke. On a scale of 10, I’ll give the club a solid 7 on performance, but from an overall value perspective a 5.5 ($100 is pushed this number down – quite a bit to pay for what is just another new chipper design). it is a “non working” number. Also, is the “short game miracle maker” your product or a knock off? Their price – $59. + free shipping. I am an average golfer with a 18 handicap and i struggle with consistency when chipping from 2-20 yards off the green. I purchased the “square strike wedge” to see if it could improve my short game. I took the club to the practice range and after 20-30 practice shots I was able to chip the ball closer to the flag compared to when i use my normal wedge. I even holed 2 chip shots from 3 yards off the green to a pin that was 15 yards from the edge. It was more difficult to chip the ball when the pin was close to the edge of the green…my ball would go past the flag more than i like but practice makes perfect. I would definitely recommend the “square strike wedge” to anybody that struggles with chip shots around the green. How long did you have to wait for it to be shipped. If this wedge is so good why don’t we see the pros using it? Clubs like the Square Strike Wedge are not intended for top level golfers, but rather the higher handicap player who struggles with their short game. We are not soliciting the club for all high handicappers by saying this, but rather stating its target demographic. Thanks for the comment! We are not affiliated with nor do we sell the Square Strike Wedge. This article merely is an overview of the product. We would recommend contacting the manufacturers for any inquiries regarding purchasing the product. Thanks for the comment! Going to the checkout page, you are not provided with customization, so it would be our assumption that the club has a standard shaft to fit most golfers. Hope that helps! When going to the checkout page, there are no customization options, which leads us to believe the club has a “one size fits most” standard shaft. Hope this information helps, thanks for the comment! Good marketing campaign, same ole golf miracle hoax…awkward feel, small grip, unsatisfactory results…so im quickly back to my 9 iron…i should have known better, but i gave it a try…save your money and time. To update my comment of April 12.I today received an email telling me the club had shipped and providing a different address for support queries.It is due to be delivered(UK) next week.Hopefully I shall then be able to try it and,even more hopefully,knock numbers of shots off my score.We shall see. Just thinking about the comments from Mark (March 4). Oversize grips are illegal on any other club than a putter. Likewise, it is illegal to move the shaft forward. Check the rules of golf Mark. Where else can I purchase this? Golf Galaxy? Dicks? I bought both the 45 and 55 degree and absolutely love these clubs, incredible feel and very accurate, all you need to do is change the grip to a larger one of your choice, I am a 5 handicap and can’t say enough good about the square strike. I bought the club and have used it several rounds. It definitely does what it is advertised to do. I have dropped 8-10 shots off my scores. It lets me take a shot close in without worry of chunking a shot or hitting it and watching it blow over the green as I commonly did with my old wedge. do you have club covers? Thanks for the comment Nancy. We do not actually sell the Square Strike Wedge; you will want to contact the company directly to see what customizations and add-ons are available. Happy golfing! I purchased one of these after reading the reviews. Thought the advertising was hokey, but decided to try it anyway. Should have stuck with my first impression. This is a nothing club and remarkably inconsistent. You can use a putter stroke until the cows come home and the results are all over the place. Much better off going back to a regular club such as a sand wedge or gap wedge to ship. More consistent and better results. Great marketing hype but a complete waste of money. I’ve carried this club a couple of weeks. It is fine in practice but somehow on the course I miss hit it more than I would any other club. I cannot justify removing any other club from by bag to find a spot for this one. I bought the Square Strike Wedge earlier this year and its very much a “go to” club for me close to the green… I play on a demanding links course in Scotland and often the “bump and run” shot is the clever play especially in windy conditions so very happy with my purchase….. Thanks for reading and the comment Ken! Complete and utter worthless piece of junk. Couldn’t get it to work on the practice chipping green. Tried it on the course, an utter disaster. Gave it to two friends to try. one a 11 handicap and other a 7. Both thought it was worthless. Should have returned it. My mistake. A monstrous marketing gimmick.